For the second time in as many seasons, the No. 18 Boston University men’s hockey team took on its archrival, No. 14 Boston College. 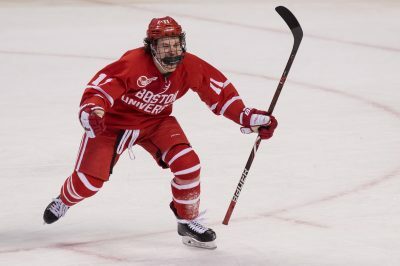 Unlike last season, the Terriers (20-13-3, 12-8-4 Hockey East) emerged victorious as they upset the top seeded Eagles (20-13-3, 18-6-0 Hockey East) 4-3 in overtime behind a game-winning goal from sophomore forward Patrick Curry at TD Garden Friday night. The game did not remain scoreless for long. Just 46 seconds into the opening frame, the Eagles took the lead. Sophomore defenseman Connor Moore released a shot from the point, which hit the post and beat Terrier sophomore goaltender Jake Oettinger to give BC the early 1-0 lead. Despite scoring the only goal in the period, BU outshot BC 13-5 in the first 20 minutes. The second period was not as lackluster as the first. Sophomore forward Julius Mattila scored the first goal of the period at 3:16 in the period, just five seconds into a 4-on-4 as BC freshman forward Logan Hutsko and BU junior forward and assistant captain Jordan Greenway found themselves in the penalty box. Sophomore forward David Cotton won the faceoff to set up Mattila’s goal. However, the Terriers did not go down quietly. Off a turnover in the offensive zone, freshman forward Ty Amonte put BU on the scoreboard 8:57 into the second. Amonte drew BC sophomore goaltender Joseph Woll out of the net, proceeded to deke him and then fired a shot to cut the Eagles’ lead in half. Freshman forward Hank Crone and Curry registered helpers. The Terriers were not finished there. One minute and 37 seconds later, BU found the back of the net once again. After spending the last month as a forward, freshman David Farrance returned to the blue line as a defenseman and picked up his second goal of the season. He one-timed a shot past Woll, by way of sophomore defenseman Chad Krys from the right circle, to knot the game at two goals a piece. It appeared that the Terriers had taken a 3-2 lead with 14:45 left in regulation. Greenway released a shot from the slot, which was ruled a good goal. However, after reviewing the play the call was overturned due to goaltender interference. At 14:41, junior forward and captain Christopher Brown cleaned up a loose puck in the crease of BU’s net. The play was reviewed, but upheld. The Terriers struck back 45 seconds later to even the scoreline. Greenway found graduate transfer forward Drew Melanson near the crease, who then finished off the play for his fourth goal of the season. Neither team was able to get past either Woll or Oettinger and sent the game into overtime. With four minutes and twenty seconds left in overtime, Curry scored off a freshman forward Shane Bowers rebound and gave the Terriers a 4-3 victory. Junior forward and assistant captain Bobo Carpenter had the secondary assist on the play. The Terriers will take on either No. 7 Northeastern University or No. 9 Providence College Saturday night in hopes of punching their ticket into the 2018 NCAA tournament. Despite needing to win, Quinn said that has not been talked about amongst the team.